We’d love your help. Let us know what’s wrong with this preview of Weddings by Karen Anna Vogel. It’s been three weeks since Granny Weaver started her knitting circle to knit shawls for tornado victims in Joplin, Missouri. She had a hunch that women spun together, like her wool, would be stronger too. At the first circle, Ruth was missing and Granny knew why. Her husband, Luke, was isolating her again. Maryann didn’t come because of her ongoing fatigue. Fannie came, but Granny almost fainted when her widowed son, Roman, seemed to show interest in this twenty-one year old. Granny wanted him to notice his old sweetheart, Lizzie, but he barely gave her a passing look, all his attention went to Fannie. It’s Mid-November now, and wedding season is in full swing. Emotions surface in everyone as they see vows exchanged between two people in love. Some are reminiscing over their own wonderful marriages, while others are plowing through this season with dread. The happiness around them only magnifies that fact they’re in an unhappy marriage or lonely, being single. How can the women help each other as they’re spun tighter together in a knitting circle? To ask other readers questions about Weddings, please sign up. Karen Anna Vogel’s writing for me is unique and has a viewpoint and narrative that I have come to quickly enjoy. Her take on the “Plain” people is poignant and ver Just because I read plenty of digital short stories , novellas and full length novels that have plenty of horror, thriller , suspense, death and mayhem undertones does not mean that I can’t take a back seat from that and enjoy a nice wholesome read on the Amish folks I so do enjoy. Okay, I like their cooking, but so many other people. Karen Anna Vogel’s writing for me is unique and has a viewpoint and narrative that I have come to quickly enjoy. Her take on the “Plain” people is poignant and very respectful. I love the definitions at the beginning of the read and the recipes at the end. They add a very nice touch to the installments of this digital short story series and for me add to it like a nice frame. The characters she has created seem all too real, they seem to just flow from her, and as a reader that just seems to draw me in more and more deeper into the universe. I just love it. “Wedding Season” is a gem and a peach of a read. If I could, instead of stars, I would give this 5 whoopee or shoo- fly pies out of five, but I don’t think Amazon Kindle, Barnes & Noble Nook, or Goodreads would change that for me. Get your Amish on and give this series a try, it will win you over very quickly. It’s been three weeks since Granny Weaver started her knitting circle to knit shawls for tornado victims in Joplin, Missouri. She had a hunch that women spun together, like her wool, would be stronger too. At the first circle, Ruth was missing and Granny knew why. Her husband, Luke, was isolating her again. Maryann didn’t come because of her ongoing fatigue. Fannie came, but Granny almost fainted when her widowed son, Roman, seemed to show interest in this twenty-one year old. Granny wanted him to notice his old sweetheart, Lizzie, but he barely gave her a passing look; all his attention went to Fannie. The second part flows beautifully. I was enchanted! I can't wait to read more. Great story Karen! This is a review on the first six volumes of The Amish Knitting Circle, they are very short stories and I've read all that are available at this time, there are more to come, Karen is already working on volume seven. I just finished these short stories by reading the last two volumes this afternoon and evening, not steadily but while stopping to to other things too, the first four I read during the short drives to town and back only, so they took a while longer. Yes, they are very short and I rea This is a review on the first six volumes of The Amish Knitting Circle, they are very short stories and I've read all that are available at this time, there are more to come, Karen is already working on volume seven. I just finished these short stories by reading the last two volumes this afternoon and evening, not steadily but while stopping to to other things too, the first four I read during the short drives to town and back only, so they took a while longer. Yes, they are very short and I read the last ones so fast because the stories are so good. Granny Weaver decides to start a knitting circle with five ladies, to make items for people in Joplin, MO after the tornado hit that community. Granny had all boys and no girls, until her sons married that is, then she had daughters. Every lady she invites has some problem that Granny 'casts' prayers for. She is doing it as much for the ladies and herself as she is Joplin, they all need the interaction with other wives and mothers, as we do. Reading these stories, you find out how the Amish deal with a lot of the same health, personal, marital and emotional problems that we have. There are some problems you wouldn't think about them having to deal with. You can get these eBooks at Amazon or Barnes & Noble for $.99 per book. They are quite enjoyable and a very quick read. quick read. its a part of a series of short stories. I'll read them all. nice when I dont' want something so involved. 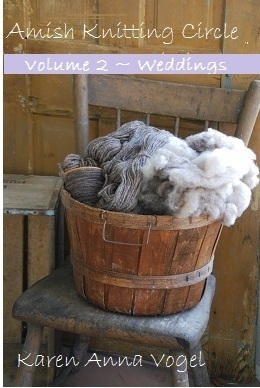 This is the second "book" of the Amish knitting circle. I am hesitant to even call it a book because it is just a few pages long, which is honestly way to short. I'd rather prefer to pay the price for a book and get a book than to pay for every chapter around a dollar and probably pay more in the end to read the whole story. These are no short stories, you do have to continue reading to find out how the story ends. This really annoys me, not a fan of this strategy! Nevertheless, I like the writin This is the second "book" of the Amish knitting circle. I am hesitant to even call it a book because it is just a few pages long, which is honestly way to short. I'd rather prefer to pay the price for a book and get a book than to pay for every chapter around a dollar and probably pay more in the end to read the whole story. These are no short stories, you do have to continue reading to find out how the story ends. This really annoys me, not a fan of this strategy!